Every small business should consider incorporating or forming a limited liability company to protect their personal assets and for tax advantages. Selection of the structure of your business venture is an important part of starting a business. There are options, but most entrepreneurs do not understand the nuances in the type of business structure. There are choices that depend on the type of business, the number of owners, and the tax implications. See our Comparison Chart to see some basic alternatives. Incorporation is a viable alternative and makes sense for most business structures. Many entrepreneurs opt to incorporate themselves. The Do-It-Yourself (“DIY”) option is a viable alternative, but why take the chance when you are investing so much into your new venture. Why take the risk of making a mistake and jeopardizing your personal liability and tax consequences? We have been helping business owners as Trusted Business Advisors get started on the right path for over 40 years. We have served as legal counsel to hundreds of business owners and have a great reputation as business lawyers. See some of testimonials. We can have you set up and ready to operate as a corporation within 24 hours. gain potential tax advantages available to corporations. Evaluate which form of business ownership is best for your enterprise. Decide in which state you should be organized. Explain all of the required filing fees. Advise you of the tax consequences of your business form. Advise you of how to protect your personal assets and limit your liability. Draft all legal documents to form your business. Register your business with the proper governmental authorities including the IRS. Check on the availability of your business name. Protect your trademarks or other assets. Provide you with a complete checklist of things that must be done to properly set up and organize your business so that it is ready to grow. A sample of our 5 page checklist can be seen on the right. All of these steps, and more, are required if you want to make insure treatment as a corporation and avoid personal liability. The process is relatively inexpensive and simple. However, before you try to do it yourself or hire a service to set up your new corporation, remember you must also take steps to apply for the tax registrations and set up the corporation books. This is the reason why many business owners turn to experienced and knowledgeable business lawyers to help them with this process. Focus your attention on building your business and making it profitable. Don’t waste your time in dealing with the setup of your new corporation. 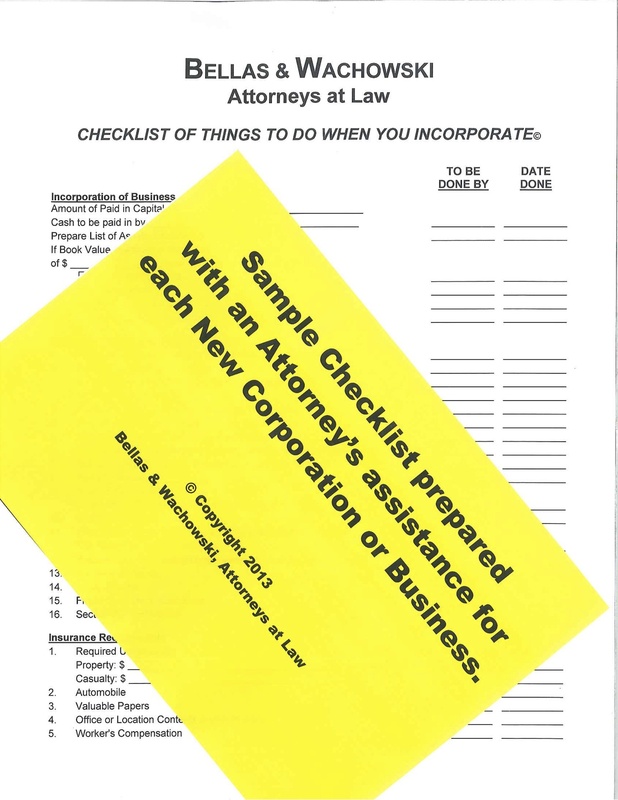 Turn to attorneys who will incorporate and setup everything for you. Build a relationship early in the process and gain the benefit of a relationship with professionals who will have a working knowledge about the structure of your business. Take advantage of years of business advice when you consult with experienced business lawyers. And once we have set you up, we don’t forget about you. We are concerned about your business growth, which is why we have developed our Corporate Maintenance Plan to promote a full business partnership with our law firm so that we become Trusted Business Advisors to your business and your family. For additional information and a free initial consultation, contact attorney George Bellas at 847.823.9032 or george@bellas-wachowski.com.